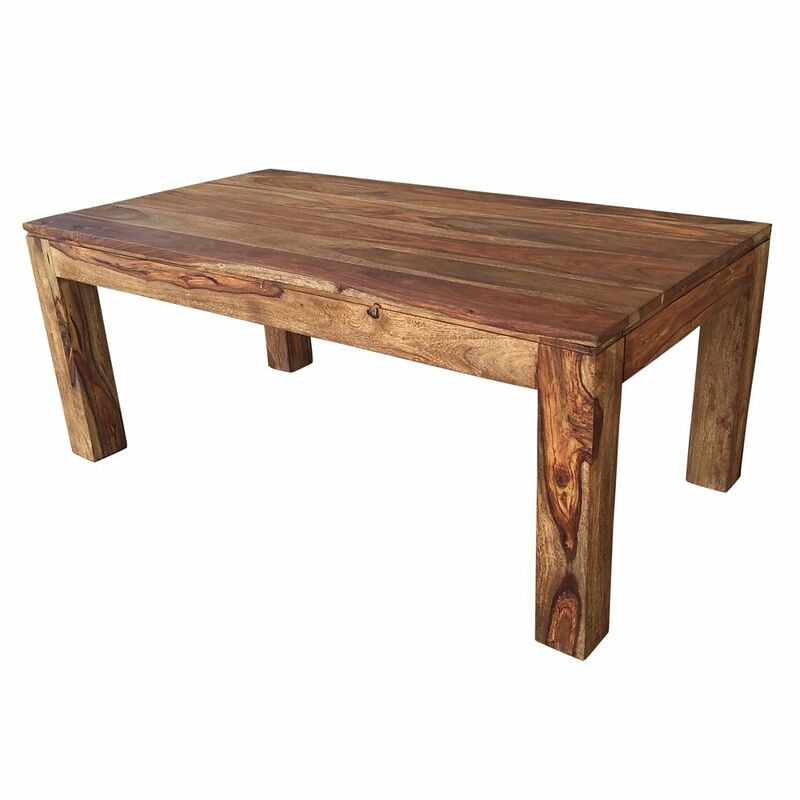 The natural beauty of Indian Sheesham wood shows in this solid wood, hand-crafted table. The natural beauty and finish of the wood will bring any room into the realm of extraordinary. The clean-line design combined with the raw look of the wood grain create a perfect example of rustic modern design. Easy to dress up or dress down for a formal or casual living space. Experience piece-of-mind knowing that this table is made with "green" materials. Wood characteristics include; mineral deposits, irregular grain patterns, unusual knots, seasonal cracks and splitting. Any of these may occur with changes in humidity and other severe climate conditions and are inherent in product. Accent tables are styled to accentuate their surroundings, but this one of a kind table attracts attention all on its own. Breaking conventional molds by seamlessly blending rustic charm and modern solidity all into one visually stunning piece, this table incorporates a rich mango wood with a functional drawer on wooden glides. Flawlessly constructed, it is further adorned with cast iron hairpin legs outfitted in an antique nickel finish. The stark contrast of both metal and natural wooden elements lend spectacularly to creating visual interest in any room of the home, while the one-of-a-kind, sand-blasted grey finish all done by hand, ensures that each table has its own unique artistry that will set it a notch above the rest. Traditional dicor no longer has to be boring. The Ambrose coffee series features a richly toned dark cherry base that gives the illusion of height and supports a tempered glass tabletop. Elliptical lines keep the look clean and refined, while the contrasting elements lend subtle brilliance to your space. With ample surface area, these tables provide plenty of space for your entertaining and living needs. Idris Coffee Table-Dark Sheesham The natural beauty of Indian Sheesham wood shows in this solid wood, hand-crafted table. The natural beauty and finish of the wood will bring any room into the realm of extraordinary. The clean-line design combined with the raw look of the wood grain create a perfect example of rustic modern design. Easy to dress up or dress down for a formal or casual living space. Experience piece-of-mind knowing that this table is made with "green" materials. Wood characteristics include; mineral deposits, irregular grain patterns, unusual knots, seasonal cracks and splitting. Any of these may occur with changes in humidity and other severe climate conditions and are inherent in product.